Bloggers’ response to continuing wildfires in central Russia  [EN] has shown that the Russian blogosphere is capable of fast mobilization, cooperation and solidarity when it comes to natural disasters. The RuNet Echo  team of Global Voices Online not only observed the blogosphere's reaction to the wildfires, but became one of the few centers of coordination of volunteers and victims of the disaster  [EN]. Following several weeks of unusual heat, Russian forests started to burn. The wildfires started in different places almost simultaneously. Sudden and deadly (over 50 people have died so far, thousands have been left homeless  [RUS]), they have wiped out a number of villages, leaving nothing behind. While regional city forums have been coordinating firefighting efforts since late July, Moscow bloggers reacted only with copy-pasting of pictures of the fires. On July 29, however, it became obvious that the disaster was nationwide, and it was then that the coordination of help started. LJ community pozar_ru  [RUS] was launched. Volunteers began to publish reports of fires approaching villages, calls for help and offers of aid. Several bloggers, especially o_liska , i_chersky  and doctor_liza  , took initiative of coordinating volunteers. It took me one day to register a domain “russian-fires.ru,” install the Ushahidi package and get things running. On Monday, I published a post at Habrahabr  [RUS], a Russian IT-community website, inviting administrators, designers, moderators and everyone who could help to join in. Right after the announcement, I received dozens of offers of help – both with the moderation and with technical support (about a hundred help offers so far). The post itself received 84 comments. Bloggers were re-posting and asking others to re-post  [RUS] the link to the site. Историю проекта “Карта помощи “, запущенного 2 августа, вообще стоило бы внести в учебники по Веб 2.0, если бы таковые существовали в природе. By the end of the first day, “Help Map” team  [RUS] (the title proposed by one of the commenters instead of the “Russian Fires,” the initial name) grew from two persons (Gregory Asmolov and myself) to nearly 20 (and a lot more now), some of whom were journalists, while others were web administrators, web programmers and moderators from various places in Russia. I didn't have time for security or background checks – I was giving access to our admin panel and FTP access to everyone who asked for it. And it worked – none of the people who offered help did any wrong to the website. Another conclusion to be made: trust is crucial when starting an Ushahidi-based system (or any crowdsourcing project) from scratch. Although the initial installation was pretty easy, technical problems did arise later. Most of them had to do with internationalization and localization. Ushahidi is a great platform, but non-Latin implementations of it still need a lot of work. Part of the text had been encoded by Gregory Asmolov for the Kyrgyzstan election project  [RUS]. Another unfortunate problem was Ushahidi's poor documentation and community support  [EN]. Another lesson: for now, those who implement Ushahidi should be prepared to rely on themselves only. As an active participant of the events, I witnessed a genuine citizen and media interest in our project. 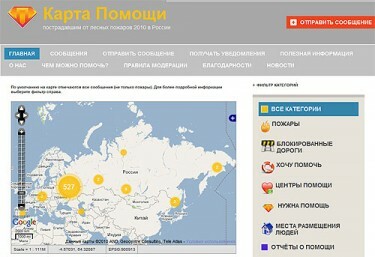 Various newspapers covered Russian-fires.ru, while Yandex, Russia's most popular search engine, added markers from our map to their pozhar.yandex.ru  portal, bringing more publicity to our project. A Russian hosting company offered us powerful hosting, and an SMS-portal provided us with their free service.